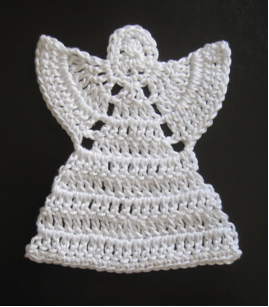 Create a beautiful angel ornament with free crochet angel patterns. This craft can be used for any time of year. You can use it as a decoration or you can sew it to a piece of clothing. It can be placed beautifully on your Christmas tree too! Free crochet angel patterns require only a small amount of yarn making them a thrifty decoration for the tree. These free crochet angel patterns also make fantastic Christmas gifts. ROW 12 • Ch 1, 2 scs in same st, 1 sc in each st across until last st, 2 scs in last st, fasten off. Click here for more information on Many Creative Gifts! I can't wait to make this for my sister. Very cute! I like the ideas others have mentioned here, too. cute and easy pattern! thanks! thanks for lovely angel, could the pattern be placed on one page though? Can someone PLEASE help me!?? I have tried to crochet this angel 5 times and it never comes out like the picture! I finally just started changing the pattern so the holes would line up! Any help would be appreciated! I really LOVE this pattern and am running out of time to make MANY for a Christmas Angel tree to hang and put the childrens needs and wants attached to the angel! Thank you ALL so much! This is an great pattern. The angel looks beautiful. I Love It! crocheterinfl How do you starch them. Can spray starch work? I would suppose making the liquid would be better. Do they still sell that? This is exactly what I thought too when I saw it. I have tons of a real light cream, red, and green. I think white would be the best, but if as an ornament for the tree, red, green, blue, etc. Let your imagination go wild. Does anyone know how long it takes to make. I better hurry for groups friends. Wonderful pattern, very pretty, very quick and easy. I will be giving them as Christmas presents. What a sweet craft! Ive got to make a few of these. I am going to make some of these. I just found this site and it is fantastic. I love Angels & I'll be making lots of these for my tree & to give as gifts. Thanks to all for your ideas. I love the idea of sending them to our military to have a "Guardian Angel in their pocket" while deployed & also for the hospital gowns. The doctors & nurses could wear them too. I'm going to take several of them & make a mobile. Dian, I'm so glad to hear that you found the pattern easy to follow, and what a wonderful way to share the angels, thank you! Instructions so easy even I was able to do it. I'll be making and sending these to soldiers so they can have an "angel in their pocket" while deployed!